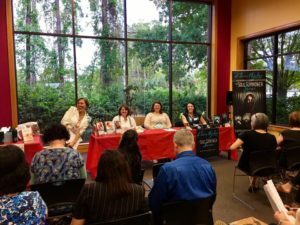 So this past Wednesday nig ht I was fortunate enough to be a part of the Love Across Sub-Genres Library event hosted by the Alafaya Branch of the Orlando Public Library and Lorelei’s Lit Lair. What an awesome night it was too! 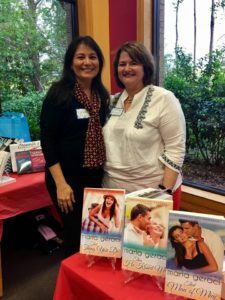 I met so many fabulous readers as well as the wonderfully supportive Danielle King, this years Romance Writers of America’s Cathie Linz 2017 Librarian of the Year. Lorelei and Danielle are absolutely fabulous ladies and I can’t thank them enough. At the event as well was Elicia Hyder who writes wonderful paranormal romance and the delightful Lucy Rhodes who literally had just gotten off the plane from Australia the day before. This is her first trip to America and we had a lot of fun asking her questions about the Land Down Under (I had no idea that there were no squirrels in Australia! Definitely my kind of place, since squirrels and I have a hate/hate relationship). As for the party: On Tuesday, April 18 join me and a million other romance authors (okay, maybe not a million, but a LOT)on Facebook to help my friend Sharla Lovelace celebrate her new Charmed in Texas romance series. There will lots of fun book talk and of course giveaways and a chance to meet some new authors. The link to the party is right here. It runs from 1-8 pm. Hope to see you there! ← Previous Previous post: Spring into Romance iBooks party!